Proper verification of system integrity for UPS and generators is done via load bank testing. We have a 400 kW load bank and cable to enable proper testing. 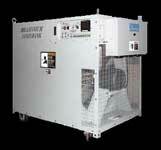 This may be used for commissioning tests when we provide equipment or rented to test existing UPS and generators.